Clean, soft and flavorful local water combines with floor-malted barley and a mix of world hops to yield a fantastically round yet snappy Lager that drinks rich and full like an Ale. Unfiltered and naturally carbonated, this is a true throw-back Lager. Place matters in beer brewing. From the quality of the local water to the spirit of the local community, place contributes character to beer. Baird Beer got its start in the fish market port area of Numazu city in Shizuoka prefecture. 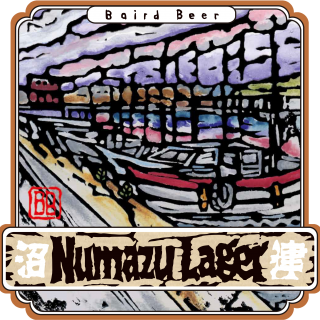 The Numazu Lager artwork depicts Baird Beer’s fish market port birthplace. Most people associate the word ‘Lager’ with beers mass-produced by large industrial breweries. These beers are light, crisp and refreshing, but not terribly flavorful. A Lager can be more than that, though. 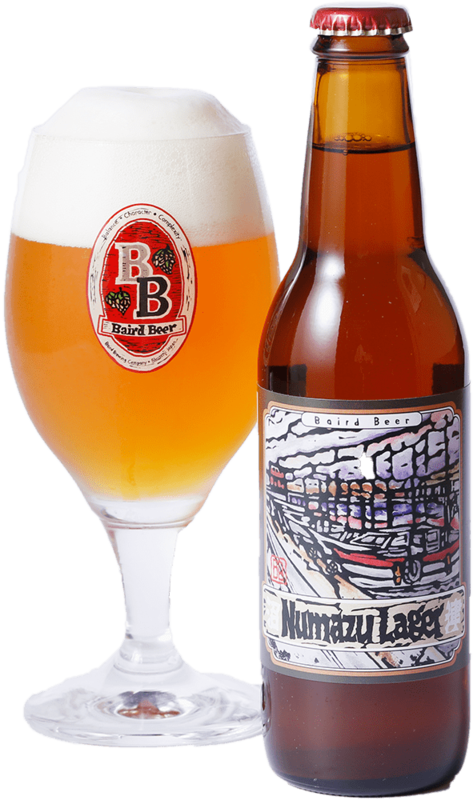 Numazu Lager is crisp and refreshing, but also rich in flavor and complexity. Water is the lifeblood of beer. As an ingredient it constitutes more than 90 percent of beer and yet you never see it listed in the ingredient section of beer labels. Historically, most great brewing centers became so because of the suitability of the local water. Baird Brewing has been very fortunate to enjoy excellent and abundant local water – first at our Numazu brewery, where we accessed city water, and now at our Shuzenji brewery, where we use water from our own onsite well. In both cases the water is soft and low in unwanted ion constituents. This allows us to use the water in brewing with minimal treatment. I believe the cleanest best tasting water is that which comes to us direct from Mother Nature, tampered with minimally by human technology. Our local water is the one ingredient common to every beer we brew. All Baird Beer enjoys a gentle roundness of character that I believe derives in substantial part from our minimally processed, soft and cleanly flavorful local brewing water. 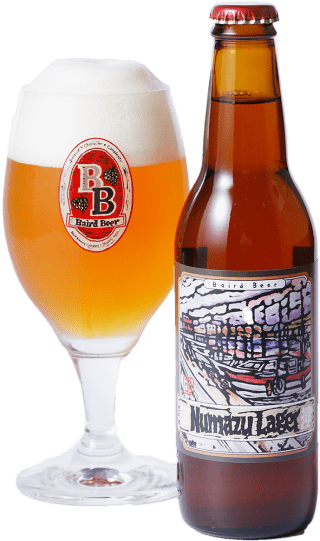 Numazu Lager is the year-round Baird Beer in which I think this character contribution from the local water to be most pronounced. Pour yourself a glass and taste what I’m talking about – water matters! I believe the cleanest best tasting water is that which comes to us direct from Mother Nature, tampered with minimally by human technology. Our local water is the one ingredient common to every beer we brew. All Baird Beer enjoys a gentle roundness of character that I believe derives in substantial part from our minimally processed, soft and cleanly flavorful local brewing water.